The year started early for the 22nd with a January invitation to make a presentation at the New York Historical Society in Manhattan. Five members attended the daylong event in full winter marching order. We had a great time talking to the public and examining the artifacts on display in the museum. Some of us stayed outside most of the day and spoke to people as they traveled up and down Central Park West, while others spoke with visitors to the museum inside. The Historical Society treated us very well with a stipend and breakfast and lunch. We also parked only three blocks away and, conveniently, right across the street from a brewpub. Our annual event at Washington’s Crossing saw the start of a theme that would affect us later in the year as well, namely rain. Saturday was a wash out. No better way to describe it. The storm was raising the river above flood stage a few miles to the South and high winds were threatening to bring some trees down. So, what would soldiers do under such circumstances in the 18th century? Go to the tavern, that’s what. Our evening meal created by Chef Eric and subsequent gathering with our friends in the NJV and Helm’s Coy. Was its usual enjoyable time. Sunday was clear and bright and we made up for Saturday with a full day of public interaction. There’s only one word to describe the Boones Homestead weekend - wet. Actually the word wet doesn’t quite do it. Rained on Friday during setup, it was raining on Saturday night when Gavin and I finally arrived and it was pouring during take down. When it wasn’t raining and we were able to get out it was so muddy that it made getting around in camp a chore. All but Tom Doyle missed Saturday’s battle. Sunday’s morning tactical was nice. Tom, Gavin and I fell out with the 55th and had fun flanking and smashing a couple of volleys into the Rebel Lights. Catching another group of Rebels between our bayonets and the 40th lights was fun as well. Then it started raining again. When we formed up for Sunday’s battle the water was pouring off my hat in a steady stream. John Torkos made it to the event (with his family) just in time to see the rest of the event cancelled. I really did feel like I was in the Infantry. 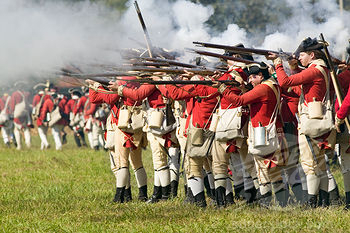 The Regiment arrived and assembled on time at Fort Montgomery October 4th at 9:30 AM. Present were Captain Vilardi, Corporal Joswick, Privates Ohme, Joswick, Doyle, Tintle, Brucia and Lustenberger. The morning was taken up with various memorial and dedication ceremonies. Captain Vilardi had to leave at noon so the command of the unit devolved to yours truly. After lunch we formed up for another dedication (of a porch) then headed down to the Pompolopen Creek to get in place for the tactical. Oh yea, while down by the creek we formed up for another dedication, (an information sign). By this time our ranks had swollen to fourteen muskets plus myself. There were uniformed Loyalists, Germans, a 23rd regiment grenadier and an assortment of men in red coats of questionable affiliation. Ultimately under the command of Lt. Col Campbell, the plan was for the main red coated force to come ashore with the Royal Navy at the creek while the green coated Rangers attacked from the woods by the parking lot and the civilian Militia attacked from the opposite side of the Rebel camp. After a naval bombardment by a jolly boat and a battue with swivels and muskets, we started our advance. I’m not a big fan of column of two street firing but given the narrow path which was very uneven and lined with loose rocks and gravel, the steep ascent and the unknown quality of some of the troops, I thought it the best KISS solution to get us all to the top safely, without exhausting just the 22nd men making a larger front. To keep it even simpler I had the men who had fired just stand to the side and reload as we advanced past so they wouldn’t have to make the climb twice. Thus, we successfully pushed the 5th New York Regiment up said rocky path with much banging away and shouting for the benefit of the spectators standing on the newly dedicated porch on top of the hill. The Rebels had a gun (Lamb’s) protecting the approaches to their unfinished fort and it was the task of the Loyal Civilian Militia to take said gun. When we reached the top of the hill I saw that the gun was still in action and since we were 50 feet away on it’s flank and the Militia was 75 yards away I decided, with the Colonels permission to take the gun. Still in column we rushed forward, quickly formed line and overwhelmed the gun. Lt. Colonel Campbell had the drummer beat the parley to give the Rebels a chance to surrender but they refused. As the assault on the fort began we advanced by files on a narrow path and were quickly inside their unfinished works. The Rangers were on our left and the Militia on our right having both entered the works at different locations. When the ground opened up we reformed our line then leapfrogged with the other two wings keeping up a steady fire and pushing the Rebels before us. When the ground opened up even more we went to open order and were able to push them even more rapidly by passing one rank through the other. The terrain and the proximity of the spectators forced us back into close order and the Militia was forced to move to the far left on the other side of the Rangers in very broken ground. For a while we had the Rebels in an “L” shaped engagement with the Rangers and Militia the leg of the “L” and us the base. We were able to deliver some nice volleys into the flanks and Rear of the Rebels before they got the picture and moved away. Now the Rangers and Militia advanced and as they came up we wheeled into line with them. The Colonel gave the order to fix bayonets then gave the order to charge! The Rebels had no place left to retreat and were soon throwing down their arms. Unfortunately Colonel Campbell fell in the assault. There followed some street theater where the Rebels were given the choice of join up or prison ship, we sang God Save The King and gave three cheers for Colonel Campbell. Everyone rose up, reformed, saluted and that was that. It would have been over sooner but the Rebels had some help from the 5th New York Zouaves and a parrot gun. The site fed us a nice dinner, which included plenty of Sam Adams Oktoberfest. We made $$$.00 for the Regiment and had a great time with some friends we haven’t seen in awhile. Guys, please feel free to chime in if I missed anything. We Came…, We Saw..., We Evacuated…. On Tuesday, November 25 a small but merry band of us from NY, NJ and PA got together to Celebrate this most auspicious of occasions. Heading into NYC to arrive at Federal Hall, our stalwart band executed a classic pincher movement, meeting up with the Long Island component right at the proper moment in the rotunda of the Hall. Low key “event” more one-on-one with the public than we’ve encountered in a long time and plenty of photo opts! More fun that a lot of us have had in a long time!